Zechariah 6:15(MSG): People will come from faraway places to pitch in and rebuild the Temple of GOD. This will confirm that GOD-of-the-Angel-Armies did, in fact, send me to you. All this follows as you put your minds to a life of responsive obedience to the voice of your GOD. In our theme scripture, it is revealed that the temple of God was rebuilt after the people had set their minds to a life of responsive obedience to the voice of God. You are the temple of God (1 Corinthians 6:19). You grow and are built up in the things of the spirit as you continually respond to the voice of God. God’s voice comes with purpose and direction and it is with this that you build everything about your life; your career, ministry, family, marriage—everything. Cultivate a life of responding to God’s voice. Sometimes it is the whispered convictions in your spirit; sometimes it is the tag of the Spirit checking your actions and stopping you from taking a certain course, responding to someone or speaking at a particular time. As you heed to His voice, you are built up in Him. 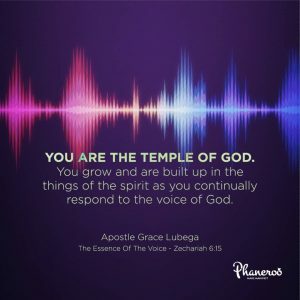 You are the temple of God. You grow and are built up in the things of the spirit as you continually respond to the voice of God. PRAYER: Father, I thank You so much for Your voice. It is more distinctive and clearer to me every day. I yield to its instructions and as I continue to obey, I am built up in faith, wisdom, power and glory. In Jesus’ name. Amen.